Shiloh Farms offers trophy whitetail, spring turkey, wild hog, arrowhead and upland bird hunting opportunities in game-rich Alabama. Shiloh Farms is located 15 miles West of Auburn University and 10 miles South of Highway 280 on Highway 50 in Camp Hill, Alabama. We offer trophy archery and gun whitetail hunts, spring turkey, wild hog and exciting nighttime raccoon hunts, as well as upland bird hunting opportunities for quail and dove. For relic and artifact collectors we also offer fantastic arrowhead hunting free of charge. We have over 4000 acres to hunt with numerous stands. 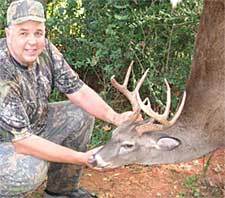 Shiloh Farms has two trophy deer areas offered for hunting. One area consists of 2500 acres that has been managed for trophy deer for the last 23 years. 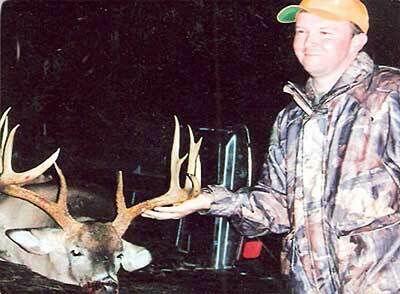 Trophy deer at Shiloh are 6 points or better or must have a 16-inch spread. The second trophy deer area consists of 1500 acres and there are no antler restrictions. There are over 200 acres of green fields and 20 acres of late planted corn that will last through the spring turkey season. Our stands consist of shooting houses and ladder stands. The stands are placed in hardwood bottoms, clear cuts, food plots and other areas used frequently by game. You will be placed in one of our stands before daylight and be picked up by our guides by late morning. We return after lunch to a different tract of land and a different stand. We constantly rotate the stands and land to prevent over hunting. Shiloh Farms strives to offer you an enjoyable and successful hunt. Deer management is practiced at Shiloh Farms with the goal of producing a balanced deer herd and the very best in trophy bucks. The protection of young bucks (yearlings and some 2.5 year-olds) combined with an adequate harvest of female deer allows us to maintain a healthy population in balance. Shiloh Farms has the very best to offer in wild turkey hunting. Our game management program ensures each hunter will have access to hunt a number of acres solely to themselves with a guide. We will have areas where wild turkeys are frequently identified for you the day of your hunt. You can call your own gobbler or have an experienced guide with you. We also offer fully guided wild boar or hog hunting, which is one of the most exciting animals to hunt. Chasing a big boar through dense scrub can really get the adrenaline running! Don't forget upland bird hunting. We now offer thrilling upland bird hunts for dove and quail. For more information on available dates and price quotes go to the Shiloh Farms Hunting web site below. To book a hunt now call: 256-896-2684 or 334-319-6337 or E mail.